Before you all shout at me for eating ready meals, I don't live on them, they simply provide an occasional convenient solution for lazy evenings. I am a big fan of Amy's Kitchen because they offer Vegan products which provide me with a safe alternative to take away meals. Over the past few years more of their products have been creeping into the supermarkets. It does depend where you shop as stores are favouring the gluten free and cheese filled products rather than Vegan ones. The good news is Tesco have started stocking Chinese Noodles & Veggies and Breakfast Sandwich, both are Vegan. Lets start with the Chinese Noodles & Veggies dish. I love the taste of this one, it has a creamy cashew sauce and is packed fully of vegetables. We all know ready meals never look as glamorous in real life compared to the picture on the box but I think this one is pretty good. It comes out of the microwave looking edible. I have already bought this meal again to stash in the freezer for emergencies. On the other hand, The Breakfast Sandwich is a disappointment. I enjoyed the meatless sausage and tofu scramble but the bun was a gluten free disaster. It has a strange texture, goes hard in places (I heated exactly as per instructions) and is far too sweet for my taste buds. I also feel at £2.49 you don't get much bang for your buck. The breakfast bun is a little on the small size but perhaps I am just greedy? I do have one complaint to direct at Tesco. They have removed my much loved Amy's Kitchen Red Thai Curry which really peeves me off. I don't understand why it could not remain alongside the two new options. Do you buy Amy's Kitchen? Do you have a favourite meal/snack from their range of products? 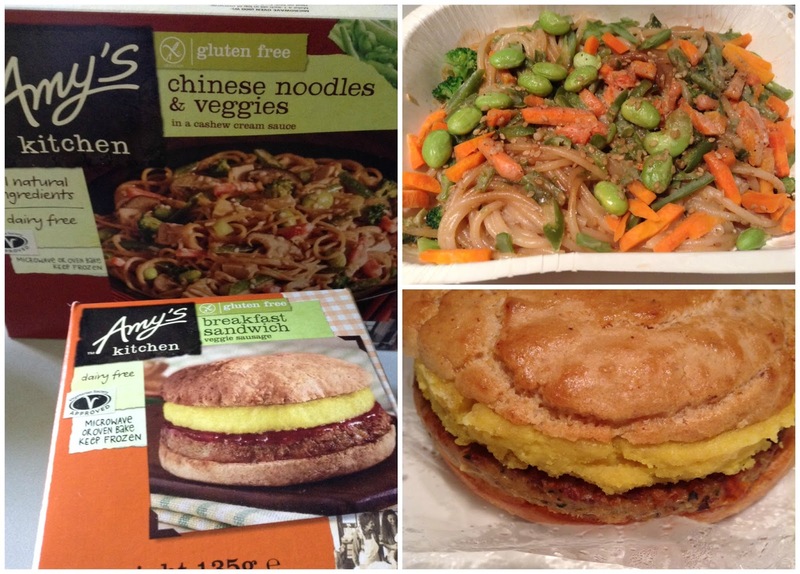 Everything I've tried by Amy's Kitchen so far I've loved. Their lasagne is the best ready meal I've ever had. The noodles look fab and even though you didn't enjoy the Breakfast sandwich, I think I'd give it a go as I've never seen anything like it.